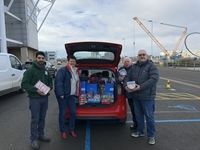 Middlesbrough Supporters Forum is delighted to announce that 804 KG of food and more than £500 in cash was donated to Middlesbrough Food Bank by generous fans before the recent home game against Reading on Saturday February 10th. With the support of Middlesbrough Football Club, the Forum arranged a donation point outside the North Stand ticket office for dry and non-perishable foods, or cash donations, to support the invaluable work the Foodbank does in the town. Generous Boro fans attending the match were joined by Reading supporters in helping to make the initiative a success. Middlesbrough Official Supporters Club and Middlesbrough Supporters South both made significant donations to the cause. In addition, the Club’s retail shop acted as a drop-off point and Club stewards held their own collection. It is hoped that further collections will be held in the future and details announced through Middlesbrough Supporters Forum, its affiliated fans’ groups and MFC. ‘Fans Supporting Foodbanks’ is an initiative that has been embraced by a number of clubs, including Liverpool, Everton, Newcastle United and Celtic, and is being launched nationally over the next few months. Caroline Walker, chair of Middlesbrough Supporters Forum, said: “There was never any doubt that Middlesbrough fans would rally round to help those in their local community who are facing a difficult time. “For Reading fans to also travel with bags of food really topped off a fantastic and heart-warming day. “The most common question asked was ‘are you doing this again’ and with the great support we received from the football club we hope to do just that. Photo caption l-r - Soroush Sadeghzadeh, Project Manager at Middlesbrough Foodbank, Caroline Walker, chair of Middlesbrough Supporters Forum, Peter Hodgson, secretary of MSF, Steve Rock, chair of Middlesbrough Official Supporters club handing over the Supporters Club contribution.